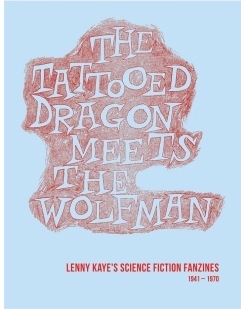 “The Tattooed Dragon Meets The Wolfman: Lenny Kaye’s Science Fiction Fanzines 1941-1970” curated by Johan Kugelberg will be exhibited by Boo-Hooray at the NY Art Book Fair from September 26-28. Lenny Kaye, who gained fame as a guitarist for The Patti Smith Group, and through his work on the compilation album Nuggets: Original Artyfacts from the First Psychedlic Era, 1965-1968, first was a Sixties fanzine fan. He published Obelisk, Sadistic Sphinx, Hieroglyph, and Pharoah, and belonged to the Spectator Amateur Press Society. Come see his collection this weekend. How Bill Rotsler’s hand-stenciled cover for a 1960 issue of his fanzine Tattooed Dragon became the exhibit’s icon is nowhere answered, but the phrase is the kind of quasi-referential nonsense beloved by fans of that era. (Like my APA-L zine named Galactic Jive Tales.) It’s certainly an attention-getting choice. As for the art, I’m sure there are readers of this blog that recognized the work as Rotsler’s as soon as they saw it. Boo-Hooray’s post about the exhibit includes many images of the more graphically ambitious mimeo (and hekto!) fanzine covers from the era. The exhibit also gives its name to a 196-page small press edition of essays about fandom and fanzine art reproductions which they will happily sell you for $40. Exhibit curator Johan Kugelberg founded Boo-Hooray in 2010 to support the archival work he began as a collector and enthusiast. He has created comprehensive collections in the fields of punk, hip hop, and counter-culture, focusing on printed works, ephemera, photography, and book arts. The NY Art Book Fair takes place at MoMA PS1, located at 22-25 Jackson Avenue on 46th Avenue, Long Island City, NY. There will be over 350 booksellers, antiquarians, artists, institutions and independent publishers, from 28 countries. Over 27,000 people attended last year’s fair. This entry was posted in Fanzines and tagged Bill Rotsler by Mike Glyer. Bookmark the permalink.